The Yamapalanaya that promised to CREATE 1 million NEW JOBS has instead LOST 0.5 million JOBS within 2 years. The 2015 Central Bank Report states that there were 8,554,000 JOBS whereas the 2017 Central Bank Employment Report states there were only 7,948,000 JOBS for over-15-year old citizens in the country. This amounts to a NET LOSS of 606,000 JOBS within 2 years of Yamapalsnaya. In addition, the jobless folks have had to cope with increasing inflation and increased taxes within this period! In what way can the esteemed Finance Minister (aka BEST FINANCE MINISTER IN Asia) and the Prime Minister trumpeting GOOD GOVERNANCE to us explain this monumental economic disaster they inflicted on the Nation?? ONE ANSWER: They are BUNCH of WADA-BARI CON-ARTISTES and outight CROOKS LOOTING the country! Oops! NOT 2017, but the 2016 CB Employment Report reported 7,948,000 JOBS! 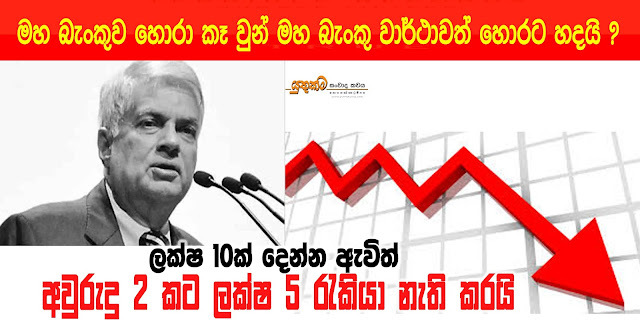 This is the same trick UNP played in 2002 when they came to power. 2001 GDP shrinkage was worsened by central bank reports so that 2002 to 2003 and beyond figures will look fantastic. For instance, the growth from 100 to 120 is 20%. But if the starting position was reduced to 80 and the ending year is at 100, then the growth becomes 25% (110-80)/80. In reality it is 0% (100 to 100). UNP did the same in 1977 to show 1978 (the first year under UNP rule was very good). But IMF DGP figures in US$ shows a huge drop in real GDP growth for 1978. However, even Mahinda government did a similar trick in 2012 when the actual population figures (due to the census) came in lower than 2011 estimate. Instead of discounting the GDP value, they kept it same but used the smaller population figure to divide it. A higher GDP per capita was reported! If calculated correctly, 2012 GDP US$ per capita increase would be smaller than most years during the war. A vital explanation why the government was losing popularity on ground. But people are smarter than that. They don’t need cooked up figures to feel the economic pinch. This entry was posted on Wednesday, May 24th, 2017. You can follow any responses to this entry through the RSS 2.0 feed. You can skip to the end and leave a response.